A little while ago my Mom bought me this round piece of cardboard (made for wall hangings) at Hobby Lobby. I didn't know what to make with it, so it ended up sitting on my desk for a few weeks. Then when I looking at some light projects, it hit me. 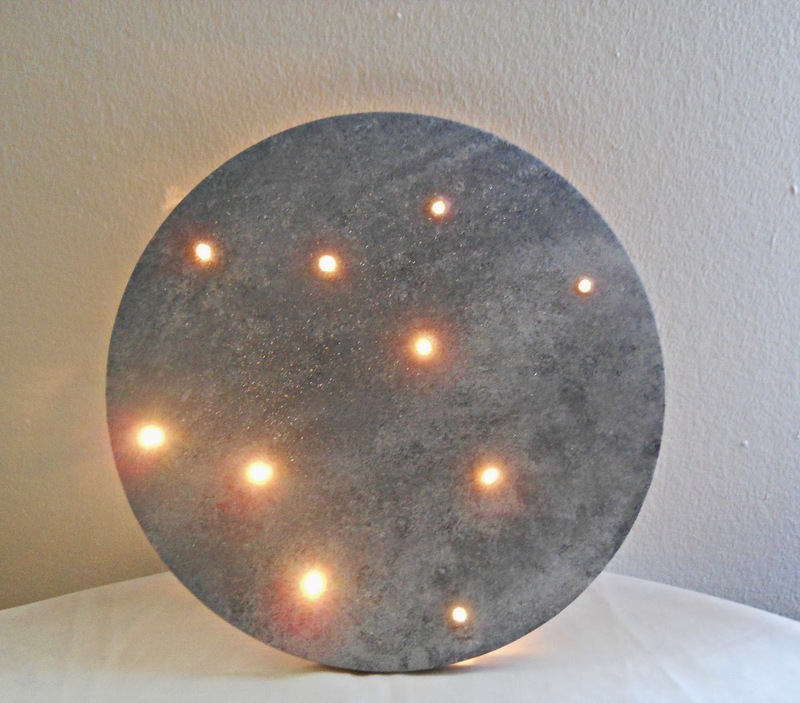 Turn the round piece of cardboard into a moon light! So thats what I'll be showing you how to make today. Before we begin I wanted to say if you can't find this cardboard circle at Hobby Lobby, you could always cut a circle out of foam-board to get the same affect. Step 1: Using a drill or awl poke 10 holes (or how ever many holes you need for your lights) into your piece of cardboard or foam-board. Before you move on to step 2 make sure your lights fit into the holes you made. Step 2: Paint your moon. I used a combination of black, gray and white paint. I also used a sponge to give the moon some texture and added a little bit of glitter for some sparkle. Once your moon is completely dry, pop in your lights and your done! I love how this project turned out! Personally, I didn't hang my moon light on the wall but if you wanted too you could. All you would have to do is glue a picture hook to back. So what do you think? Do you like this moon light? p.s If you want to make another moon project, check out my mini moon banner by clicking here! Also, the fact that you painted the moon is amazing- When I first saw it, I thought you'd printed a picture of the moon. We could most definitely be crafting buddies (lol)! Aww, thanks so much. I spent a lot of time painting that moon. I ended up painting about three or four different layers. wow, this is great! I really need to make one of these!